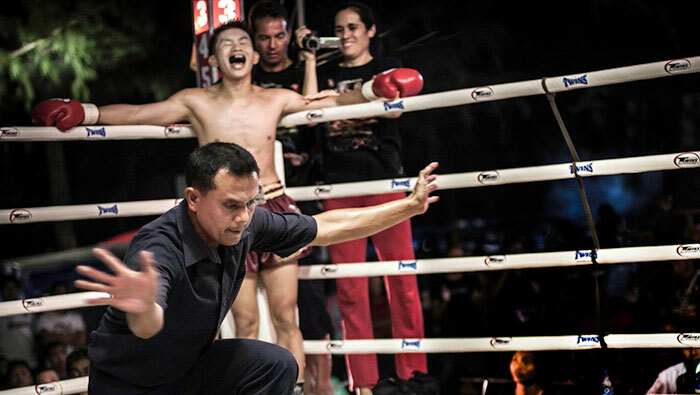 Students who want to have a professional fight in Thailand can come to Rawai Muay Thai to prepare. Our teachers can help get you in the best shape of your life. The fighter training is rigorous, running twice a day and gym training twice a day. But the reward of fighting in a stadium with an audience is worth it. We have sponsored boxers who live and train in the gym daily. Our foreign students who want to fight need to first speak with either Kru Tuk or Kru Fin to get approval. Tepwarit training with Tuk in the old gym in Phuket. Wangna, young fighter in Lumpini. Trainer Dam’s fabulous front kick. Trainer On in Lamken Temple Fair.